Wooly World takes players to prehistoric times. The Ice Age seems to be just over because the background to the reels shows dense green foliage and bright sunshine. But some of the animals are yet encapsulated in ice as the symbols on the reels depict. These are the Saber-toothed Tiger, the Elephant and the Beaver. The Caveman, who is the wild symbol, is free and so is Wooly the mastodon, who is the scatter symbol. The symbols are crafted in a comic style, which adds a touch of cheer to the environment. The game sounds, win sounds and background sounds are distinct but note particularly note worthy. Most of the symbols only flash when they appear in winning combinations. However, the two main symbols, Caveman and Wooly, show real animation and these make up for the rest. Caveman lets out a laugh and bangs away with his hammer. Wooly charges full speed ahead in cartoon style on his wobbly legs in a loveable manner. The coin denominations can be varied in stops from 0.01 to 0.25. Players can wager up to 10 coins per payline and the slot game has 20 paylines. The maximum total bet works out to 50.00 credits. In the regular mode the number of paylines and coins can only be increased, but in the expert mode these can be increased and decreased. The Caveman wild symbol appears only on reels 2 and 4. Also it does not directly offer any payouts. But it makes up for this by multiplying all payouts four times when it combines with other symbols to make winning combinations. Two or more Wooly symbols offer scatter payouts when they appear anywhere on the reels. Five Wooly symbols offer a scatter payout of 200 coins, which is multiplied by the total bet in order to convert to credits. 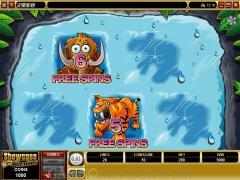 When three or more Wooly symbols appear anywhere on the reels at the same time the free spins feature is triggered. 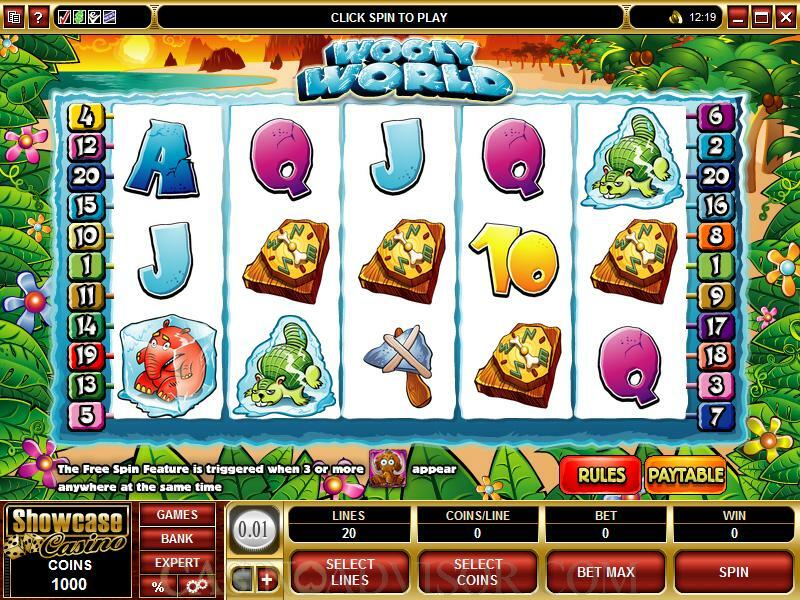 The number of free spins is determined by a bonus game on the second screen. The second screen reveals five animals frozen under ice. The player has to select three animals that reveal the number of free spins awarded. The free spins offer doubled payouts. The free spins can be retriggered. However, the bonus game is not played again. The player gets the same number of free spins that were awarded earlier. 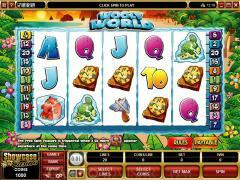 Wooly World offers the Gamble Game after each payout. Players who not want to risk their winnings can click on the Collect button and get the winnings transferred to their balance. However the risk taking players can click on the Gamble button and play the Gamble Game. In the Gamble Game they have a choice of trying to double their payout by choosing either Red or Black or of trying to quadruple their payout by choosing one of the four card suits. Players can continue playing the Gamble Game till their gambling limit is reached. Interested in reading more detailed information about Wooly World? If so Click Here for more details.